The opening gap that you can use as starting point on removing the back cover casing of Samsung Galaxy S II can be found on the top-right side of rear panel (pictured). You need to open the cover in case you want to insert the SIM, install the memory card, or assemble / disassemble the battery. Insert the fingernail of your forefinger or thumbs into the starting-point gap, hold the body of the phone with your other hand, then pull the cover up until the cover partly detached (on top side where the camera hole locates). Then insert your fingernail into the sides that still attach with the body and lift the sides cover until all the sides are detached and casing fully removed. 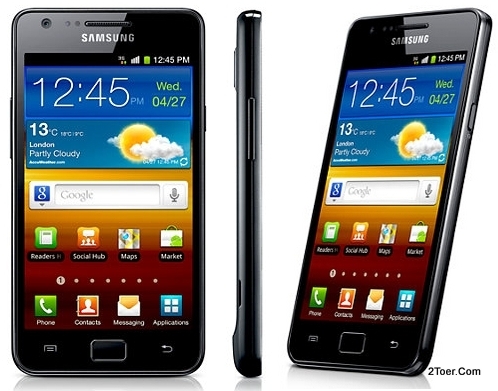 The SIM card slot of Samsung Galaxy S2 locates on the top-right side battery compartment or directly under the 8 Megapixel rear camera. Align the SIM card of your carrier (standard SIM type) with the slot, make sure the gold-contacts of the SIM facing down, then slide and push the sim with your finger until the SIM properly inserted. In case you want to add extended memory card (up to 32GB), make sure that the battery isn't assembled on its compartment. If it's assembled, you need to remove it first before you able to insert your microSD card. That's because the mouth of the memory card slot directly face to face with the battery compartment. It's on the top-left side of the compartment. With gold-contacts facing downward, slide the microSD to the slot, and whenever it partly inserted, continue by pushing it with your fingernail until the memory card locks inside the slot (reach the end). If you wanna remove it, you can eject the card by press it again the slot to make the card unlock then half pop out, then grab with your fingertip and pull it out from the slot. But before you do that, make sure you had done this steps: Go to Applications > Settings > Storage > Unmount SD card > OK.
Now the next steps are Assemble the battery and also close back the cover casing. For assemble the battery just align the metal-contact between battery and compartment, make sure the SAMSUNG logo facing upward, then slide and press the battery to the compartment. Done. For covering back, just slide the bottom side cover with the bottom body of the Galaxy S2; align the camera hole with camera body, then press the sides of the cover until it fit with the body. If there is still a gap between the body and cover, press it just on the location of the gap until the cover clicks. Done. You can reboot / force restart Samsung Galaxy S2 (whatever your Android version installed) by pressing the Power button for about 10-12 seconds. That a good way on resolving "small-light" problem such as your phone suddenly hang or slow respond. But on Hard Reset aka Factory Data Reset via the Settings, between SGS2 with Gingerbread and SGS2 with ICS aren't the same. Samsung Galaxy S II with Ice Cream Sandwich Android Version 4.0.4: Settings > Backup and reset > Factory data reset > Reset phone > Erase everything. The differences only take place on Privacy replaces with Backup and reset. You must back up all your data including photos, personal videos, contacts, sms, document, before doing this Reset option. That because all data would be erased including downloaded games and applications.